In the early 1940’s an errant ruminant mammal known as El Chivo Pepe roamed the Ponce streets, drinking, smoking and even philandering after young ladies in its path. 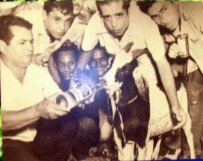 The legendary male goat thus became very famous among the Ponce citizens and was specially pampered and protected by the city bohemians. Big, strong, with a half broken horn and its huge, expressive eyes, Pepe was always playful and friendly when patronized with some liquor or tobacco by its human counterparts. He was fatally stabbed in 1945 at the intersection of Reina and 25 de Enero streets, by a wrongful defendant of one of Pepe’s innocent would-be lady “victims”. The aggressor was eventually arrested, processed and sentenced to a 6 months jail term. In his memory, a couple of songs by renowned local composers were later dedicated to this famous animal character. A mural about Ponce traditions by artist Epifanio Irizarry portraits El Chivo Pepe at the main Ponce Fire Station. Pepe's story is also rightfully depicted at the Museum of Ponce History.